Available in AFV10700H / AFV10700HS models in bolt-down and solder-down styles, RF Power LDMOS Transistor is housed in NI-780 air cavity package. Operating in 960-1215 MHz frequencies, unit is suitable for defense and commercial pulse applications such as friend or foe (IFF), secondary surveillance radars and ADS-B transponders. Transistor offers a power density of 700 W in 1.3 x 2.6 in. 50-ohm matching area and supports ELM and Link 16 pulses. 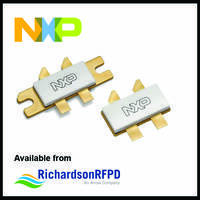 Richardson RFPD, Inc. announced today the availability and full design support capabilities for a new RF power LDMOS transistor from NXP Semiconductors. The AFV10700H / AFV10700HS, available in bolt-down and solder-down styles, is designed for pulse applications operating at 1030 to 1090 MHz and can be used over the 960 to 1215 MHz band at reduced power. It outputs 700 W P1dB at 1090 MHz, with 50 V and 56 percent efficiency. If operated at 52 V, it can achieve 850 W P1dB at 1030 MHz, with 52 percent efficiency. The new device features highly-integrated on-chip pre-matching and outstanding thermal resistance. The new LDMOS transistor is suitable for use in defense and commercial pulse applications with large duty cycles and long pulses, such as friend or foe (IFF), secondary surveillance radars, ADS-B transponders, DME and other complex pulse chains. It is the latest addition to NXP’s leading portfolio of L-band devices for aerospace and defense applications. The AFV10700H/HS is based on NXP’s Airfast technology and is contained in a small NI-780 air cavity package, which occupies 40 percent less space than the standard NI-1230 package used by other LDMOS solutions with a similar power level.